In India, everybody will tell you your aukaat (in Hindi औकात) (limits). But when you cross those limits, world will think you are successful. 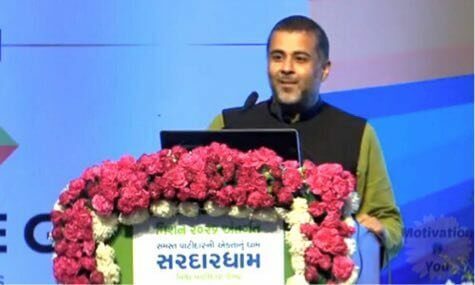 I (Chetan Bhagat) was born in a middle class family. I got 76% in tenth standard. My maternal uncle told my parents that i couldn’t achieve anything in my life. They set limits for me, so I planned my future according to my limits. I decided to open STD booth. But then I thought that I am just 15 years old, and my life is already decided according to my aukaat ( limits), just because I didn’t get good marks in matrix. I decided to study hard to get admission in top most institution. I prepared for IIT and got admission, i crossed my limits. My same uncle said, I knew it, he will do something good in his life. I was not any topper or genius. If I can do this, anyone can do anything. If you want everybody to consider you a successful person, just cross the level or limits of your family. You can achieve short term goals by pushing yourself to work. But you can not achieve your long term goals by pushing yourself. When someone says that, this thing is impossible for me, that is not actually impossible but out of his limits. It needs long efforts to cross that limit. First you need to prepare yourself mentally. Don’t think that only genius can achieve it. I follow 6 steps to cross my limits. The first step is to setting goal. Convert your dream into goal by setting time limit. The second is, there should be a valid reason behind the goal, live for that reason. The third step is to find a positive group with similar goals. Fourth is to make a detailed action plan. You should break down your long term plan into small parts. The fifth step is to set back dealing mechanism with distraction. And the last is to keep faith in yourself to deal with anxiety and negativity. You don’t need to be genius or super intellegent, but to be focused to cross your limits. First work, then enjoy, that’s what makes the difference. Underpromise and overdeliver, reinvent and keep patience to get success in your life.